This review contains spoilers for the previous books in the series. Tis the season to knit and be merry! The Friday Night Knitting Club are back for this festive third instalment. Dakota Walker, the co-owner of the Walker and Daughter knitting store, is now twenty and in school working towards becoming a pastry chef. Christmas is the time for family to come together, but Dakota is offered a prestigious Christmas internship that would mean missing family Christmas in Scotland. While Anita is trying to plan a New Year’s Eve wedding, Catherine is blissfully in love with an Italian widow. KC is enjoying the single life, while Lucie and Darwin struggle with raising their growing families. As the very different members of the knitting club struggle with the many changes occurring as Christmas approaches, they will never forget Georgia Walker, the woman who started everything and brought them all together. I never wrote a proper review for The Friday Night Knitting Club, which I read a few months ago. 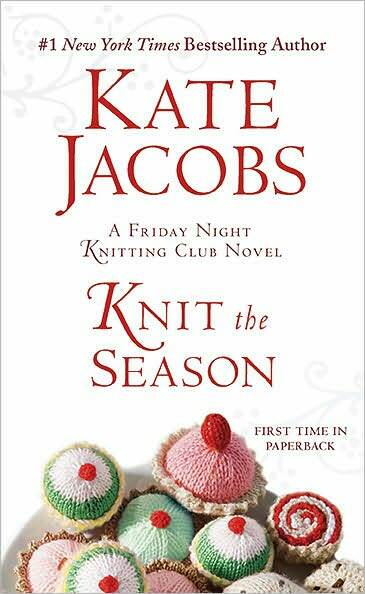 I was drawn to the premise, since I like to knit and I enjoy books about people coming together. I also like to fantasise about owning my own shop (books not knitting,) so I was drawn to a novel about a young mother starting a business based on her passion. I thought that it was filled with too many life lessons and heart to heart conversations, and the writing had some flaws. Overall, I would rate it at 2.5 out of 5 stars. I bought the third book in the series (thinking it was the second) because it was on discount and I was looking for a holiday book to read. As Christmas approached, I kept putting off reading Knit the Season. I finally got to it today (December 22nd) and I enjoyed it more than the first book. While I probably should have read Knit Two before reading the third book, it was easy enough to understand what was going on. There was considerably less knitting in this book, and I think we only saw one of the club’s meetings. This book focused mainly on Dakota, with very little focus on KC, Lucie and Dawin. In the first book, Dakota was only 12. While I thought she was spoilt, she was quite young so I felt I couldn’t hold it against her. Now Dakota is 20; only a year younger than me and the same age as my brother. While I might forget what 12 year olds are like, I know what the average 20 year old is like and I thought Dakota was a bit immature and very selfish. Everything had to be about her, and the other characters helped encourage this. The Friday Night Knitting Club is made of several very different women, bonding over a shared passion. Strangely, I didn’t connect to any of the characters. There were ‘Georgia flashbacks’ throughout the book, and they felt awkward and unnecessary. All of that aside, this was a quick read that kept me engaged and wanting to keep reading until the last page. It was fun and I think fans of the series will enjoy this addition. It would actually make a good end to the series, although I’m not sure if the author intends to keep writing about the Walker and Daughter knitting shop or not. As a Christmas book, Knit the Season doesn’t offer anything special, although I did like that it also showed Chanukah celebrations. Knit the Season shows Christmas both in New York and Scotland, which was interesting. Fans of the series will enjoy this festive novel, which shows these friends trying to make the most of their lives, one stitch at a time.